You’d think this would get easier! But, you’d be wrong. 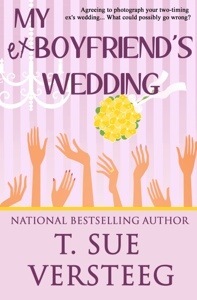 I’m just as excited and nervous with today’s release of My Ex-Boyfriend’s Wedding as I was many years ago, when my first baby, Another Time, Another Place, was born…erm, my first book was released. Same thing really, if you think about it. Well, no labor pains. Though, if you count the pain of intricate edits and total scene rewrites, we are back to shocking similarities. Alas, it’s here! Quick, someone mop my forehead and bring me some ice chips. As I’m posting the buy links to my ‘baby’, I’m kind of losing the whole similarity vibe. I’ve never ONCE sold one of my human children. Tempted, yes, but it never happened. Swear, even through the traumatic teen years. I’m more than happy to sell my literary children at the links below, though. The more, the merrier! Agreeing to photograph your two-timing ex’s wedding… What could possibly go wrong? Most women have them: those two very distinct, very different voices in their mind. One can usually be chalked up to common sense, the other to mischief, mayhem or just plain morbid curiosity. Both are always there, though, ready with their two cents worth. Jemma Keith is no exception to the rule. She doesn’t have a problem agreeing to photograph her cheating ex-boyfriend’s wedding. The dilemma, however, is what to do once she gets there. Common sense feels like taking the high road; she can handle being the better person. Mischief wants to slither in, crashing the whole affair down around his worthless ankles. What’s a woman to do when she can’t make up her mind? At least both sides are in complete harmony about the bride’s cousin, Anthony Giovanni: he’s hot, handsome, and oh, so tempting. Join Jemma as she weaves through a web of lust, temptation, revenge, and maybe even love.